MASL provides all the medication for the epilepsy project – 5 types of medication to treat various epilepsies – purchased and shipped from the UK. This costs around £15,000 annually. Please help us mark International Epilepsy Awareness Day on 12 February by supporting our medication bill. For 70% of patients, this treatment completely stops seizures and other forms of epilepsy; for 20-25% it will mean reduced seizures/absences/other manifestations of epilepsy. Uncontrolled epilepsy directly affects health and social and economic capacity – preventing participation in education, in employment and forcing individuals and families into poverty. Our Chair of Trustees has set up a page on Virgin Money Giving. Please consider supporting the costs of this life-transforming medication. 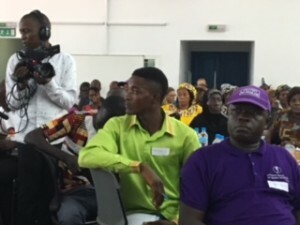 Medical Assistance Sierra Leone and the Epilepsy Association of Sierra Leone (EASL) were pleased to participate in the first autism conference in the country in Dec 2017. Around 25% of people with autism also have epilepsy – we are not seeing these numbers at clinic and the Epilepsy Association were there in full to learn how autistic people and their families may be better supported to come forward and access medical services. The Pan-African Experiences of Autism: Transforming Rights Into Reality Conference took place at The British Council in Freetown on 4 & 5 December 2017 and was extremely well attended, with participation from parents, carers, teachers, NGOs, health workers and Ministry officials. The event marked the International Day of Persons With Disabilities and staff have already identified children with autism in the community in need of support as a result of detailed information, along with insightful film case studies, provided at the conference. With a network of 22 clinics now established through our partnership work, a necessarily ambitious programme of awareness-raising needs to be delivered in order to reach the large number of people with epilepsy in Sierra Leone who currently receive no treatment. Alongside this, capacity needs to be maintained and strengthened within the health sector so that skills are kept up to date and new staff coming through have a basic understanding of epilepsy diagnosis and management to make appropriate referrals. 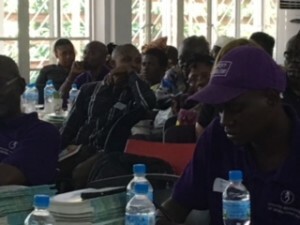 We have recently secured some support for a public awareness-raising campaign and community awareness activities, led by Epilepsy Support Workers in Bo, Kabala and Freetown. The Support Workers are reaching out to schools, places of workshops and community leaders to promote accurate understandings of epilepsy. Later this year we will be producing radio adverts and a short video for showing on TV to highlight the key campaign messages. 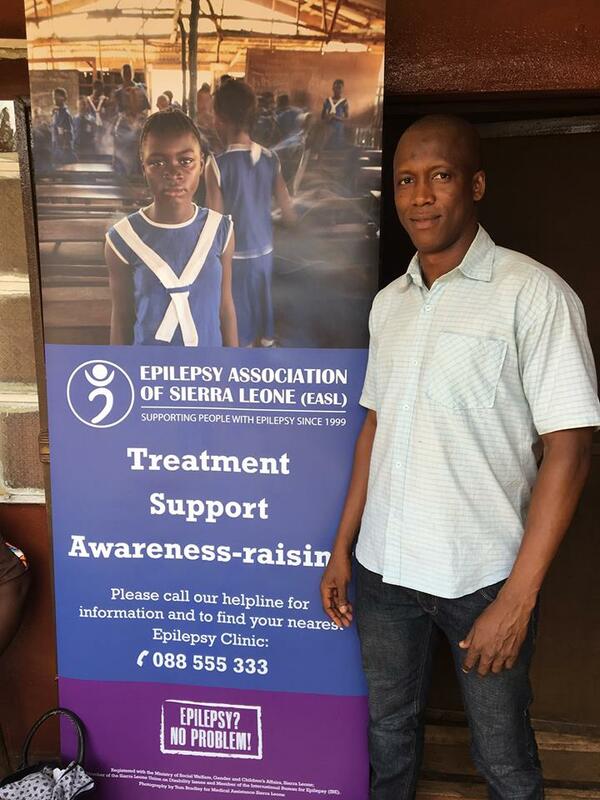 Dr Jalloh, a member of the epilepsy clinical team, at the offices of the Epilepsy Association Sierra Leone, Rokupa, Freetown. THANK YOU to those people and companies who have supported us in the last few months, as we have tried to respond to the many requests for assistance from partners in Sierra Leone. The Sierra Leone community in Reading have led on multiple fundraising events, including meals, sponsored walks, a gala night, as well as holding collections in workplaces (Vodafone, Motorola, Optalis), churches and mosques. This has enabled us to buy protective supplies and ship these along with other donated clinical goods to clinics and hospitals. Many volunteers gave their time over two weekends to help with loading the trucks. We have been able to provide food aid to quarantined communities in Port Loko, and with the help of the Epilepsy Association and Suafiatu Tunis of Community Response, extend support to the families of 30 health workers at Kenema Hospital who lost their lives looking after patients during this outbreak. We are grateful to Mr Rajwani in Freetown for the free use of his truck and driver for two days for the transportation of bags of rice and other essential goods to Kenema. Additional donations of clothing and food have been distributed to those in need including survivors of ebola in Port Loko and Rokupa, members of the Epilepsy Association, and orphans in Freetown and Port Loko. Collaborating partners include Amazonian Initiative Movement whose pioneering kindergarten has now been given over to 40 children orphaned by ebola who are being cared for by volunteers. Any help that individuals wish to extend to affected communities will be despatched immediately. We are grateful for all the support received. ‘Significant international efforts are needed, not only to stop and contain the Ebola epidemic, but also to limit its indirect effects on health service functioning’. New report highlights the devastating impact of ebola on health services in Sierra Leone. Summary and report available below. This December 2014 research report illustrates the impact of ebola on the health care system in Sierra Leone. Inpatient health services have been severely affected by the Ebola outbreak. The dramatic documented decline in facility inpatient admissions and major surgery is likely to be an underestimation. Re-establishing such care is urgent and must be a priority. ‘To put a number on Ebola’s indirect health service effects, our results indicate that an estimated 35,000 sick in Sierra Leone will be excluded from inpatient care from the onset of the epidemic in mid-May and until the end of the year if current low level of admissions remains. Significant international efforts are needed, not only to stop and contain the Ebola epidemic, but also to limit its indirect effects on health service functioning. MASL Personal Protective Supplies destined for Lumley Gov Hospital waited weeks to go by air due to flight cancellations, and arrived last week, the day that Doctor Buck at Lumley Hospital was confirmed with Ebola. The death of Dr Buck is devastating. Our thoughts are with Dr Buck, her family, friends and colleagues and with all struggling to control this outbreak. Like many health workers, the staff at Lumley Government Hospital have been working without adequate Personal Protective Equipment (PPE), leaving them in an intolerable position. Piot said Cameron should sanction the release of up to 100 NHS doctors and nurses to go to Sierra Leone and Liberia and called on the UN to put an international emergency programme into action. “There is no way that the three countries effected most can handle this on their own,” he said. Piot also called on British Airways and other airlines including Air France to resume flying to the two countries, saying the closure of services this summer “has not been helpful” to the aid effort. He said security could be guaranteed if passengers were screened before boarding. ‘In the immediate term, field hospitals with isolation wards must be scaled up, trained personnel must be dispatched, mobile laboratories must be deployed to improve diagnostics, air bridges must be established to move personnel and material to and within West Africa, and a regional network of field hospitals must be established to treat medical personnel with suspected or actual infections’. Major and urgent intervention to control the outbreak is now required. Health workers need protection. The resumption of flights is essential. It is not possible to exaggerate the impact of the Ebola outbreak: people are afraid to leave their communities for essential items and support, are avoiding health centres for treatment for conditions such as malaria and diarrhoea disease, are giving birth without medical supervision, and struggling to meet the rising costs of food and everyday items. Communication is breaking down as charging mobile phones in rural areas becomes a major logistical challenge, leading to increased isolation at a time of desperate need. Communities in Sierra Leone have no additional social and economic capacity to deal with the effects of this crisis. Large scale international cooperation is required as a matter of urgency. Medical Assistance Sierra Leone has received urgent requests for anti-bacterial hand gel and disposable thermometers from local partners and clinics in Sierra Leone. The epilepsy project has a network of 22 clinics, supporting nearly 5,000 people with essential anti-epileptic medication. Health workers are operating in impossible circumstances, many without the necessary resources to protect themselves and patients. Two health workers trained by the project, and focal points for the epilepsy clinics in their areas (Kailahun and Kenema), died from ebola in July. or you can also click on one of the icon buttons on the right to donate. Partners in Sierra Leone are preparing for Epilepsy Awareness Day on 26 March. Also known as Purple Day, this dedicated day is an opportunity to raise public awareness of epilepsy and encourage those affected to come forward for treatment. Over 90% of those affected in Sierra Leone are still without medication. This year the theme is ‘Each One Bring One’ : we are encouraging people to understand more about the symptoms and to think about supporting a friend, family or community member to attend one of our project clinics, which are now established across the country. Two cardiotocography (CTG) machines arrived in Freetown in February, shipped by MASL and donated by Warwick Hospital to Lumley Government Hospital. These machines are used in pregnancy to monitor the foetal heart as well as the contractions of the uterus. Training by midwives from Warwick Hospital on the use of the machines will take place shortly.